All documents for Authentication must be less than one year old. All marriage, birth, death, divorce certificates and single status statements must be issued from Department of Vital Records in the past 12 months. Marriage Certificates may also be issued by the corresponding Circuit Court as exemplified copies or certified with triple seals. 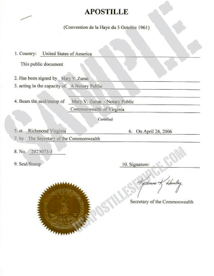 All other documents must be properly notarized by a Virginia notary and be less than one year old. Marriage certificates can also be obtained from the Circuit Court in the city where the marriage was recorded. These black and white certificates must be accompanied by a Triple Seal Page, also called an Authentication of Record. This is a separate sheet of paper from the Court with the signatures and seals of the Court Clerk and Judge. This additional page must be attached to your document. Business documents, such as Certificates of Good Standing, Articles of Incorporation and Corporate Amendments and Resolutions obtained through the State Corporation Commission which bear the signature of the Clerk of the State Corporation Commission and do not need notarization. 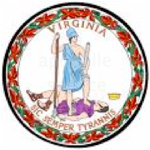 All other documents requiring authentication for foreign use should be notarized by a Virginia notary. These documents include Power of Attorney, school transcripts and diplomas, and copies of passports and immigration paperwork.